Yes, I’m on a sweet potato kick, in case you hadn’t noticed. But what to do with all this extra mashed sweet potato? Make pancakes, of course! Though you could just substitute sweet potato for pumpkin or butternut squash in these pancakes, I decided to adapt the recipe a bit because sweet potato is naturally sweeter — who would’ve thought?! — than squash. The cakes were a beautiful golden-orange color and were moist yet light. They tasted good with yogurt/sour cream or peanut butter and maple syrup on top. I even flirted briefly with the idea of topping them with more sweet potato, but that seemed like overkill. 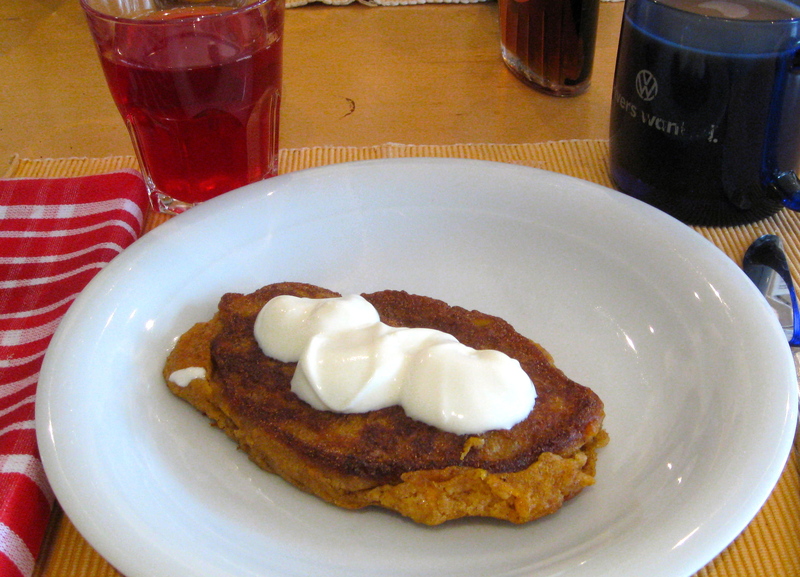 If you love sweet potatoes, you must make these pancakes as soon as possible. Plus, you’re eating veggies for breakfast! Doesn’t that make you feel virtuous? Whisk together the dry ingredients. In a separate bowl, combine the wet ingredients. Add the wet to the dry and cook in oil over medium heat. This entry was posted in food, health, pictures, recipes and tagged breakfast, brunch, pancakes, sweet potatoes on 03.03.2013 by taplatt.